Wendy's challenge was to do a panning shot, a technique I have never succeeded at. I thought I'd have to take a 'rain check' on this as it's chucking it down. However, never one to let down a challenger I braved the Biblical deluge. Wendy, I took 130 shots!! I started on traffic at a pelican crossing (I think many thought I was a pensioner pretending to have a speed camera!). I then popped to the play park- funnily enough devoid of children. 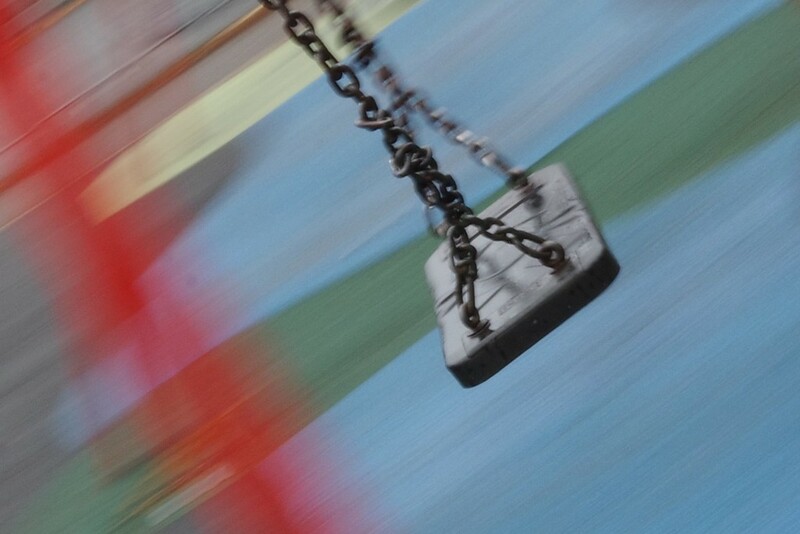 I practiced on the large tyre swing than moved onto the group of four smaller swings, hoping to have front one in focus with other three in the background blurry. I got one nearly successful traffic shot, one OK tyre swing and a couple of goodish swings. I cropped this as the raindrops on the lens were so distracting, and I think it shows I was finally successful at panning on shot number 128!! @farmreporter Here you go Wendy! I'm may now die of double pneumonia due to unusual exposure to rain, my newly styed hair is back to frizzy but my camera is truly damp-proof!! I think you succeeded - excellent panning! Cool shot... apparently practice does make perfect! Awesome shot! I REALLY like it - and I think your now have a new technique under your belt! So sorry for your hair (lol!!) but this is well worth it! Your narrative made me smile!! A FAV!! A fabulous and very successful shot! Lovely colours. I love it, a huge fav. Love the subject, love the title, love the story. Well worth double pneumonia and frizzy hair. Jackie - I almost put the wrong tag for the eotb challenge and noticed that you did as well. There is no hyphen in the tag - it is just eotb99 . Would hate to see you miss out with this challenge! Super photo; your efforts are appreciated! @lanikyea yup!! My reaction too as I actually succeeded!! @farmreporter thank you Wendy. I so nearly let the weather stop me. Thanks for eotb tip too. @suemcqueen apparently. But it does help if it works straight away I find!!! @quietpurplehaze you should see the remaining 129- not good. This is great - mission accomplished! @4rky We have them out in the villages- pointing hairdryers at cars! !